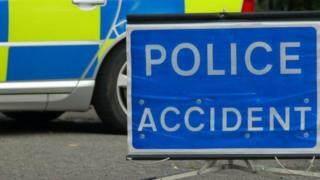 A vehicle has crossed the central reservation on the M4 motorway in a crash near Swansea. The M4 was closed eastbound between junction 45 at Ynysforgan and junction 44 at Llansamlet because of debris after a vehicle travelling westbound crashed onto the opposite carriageway. There are no reports of any injuries after the incident at about 15:00 GMT on New Year's Eve. Traffic is queuing in both directions on the M4 around Swansea.